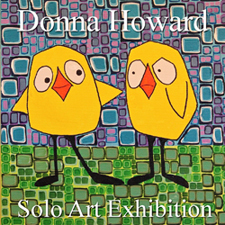 Light Space & Time Online Art Gallery is very pleased to announce that Donna Howard has been selected as one of the four artists of the gallery’s third “Solo Art Series” Art Competition. Donna will have a month long solo art exhibition and she will be featured on the gallery’s front page, as well as in the “Solo Art Series” archive. Donna Howard lives in Woburn, Massachusetts, where she is an award-winning painter and whimsical artist. Donna will be promoted by the gallery with an extensive public relations campaign, as well through the gallery’s extensive social media network. Also, part of her award package is that she is now featured as an Artsy.net Light Space & Time promoted artist. In addition, Donna will be featured on the gallery’s YouTube channel, with an event catalogue and with an event postcard. The “Solo Art Series” is a series of monthly solo art exhibitions for established artists who have a body of work to present to the public. Artist participants were asked to submit the following 3 components for the “Solo Art Series” competition; 1. Their art. 2. Their artist biography. 3. Their artist statement. These elements were evaluated and judged, which resulted in the selection of the artists who will be featured in individual month long solo art exhibitions. This is the third “Solo Art Series” Art Competition the gallery has conducted. Below is Donna’s Artist’s Biography, her Artist’s Statement, along with 25 of Donna’s images. We hope that you will take the time to read Donna’s information and to take a look at her wonderful whimsical art. Note: Donna’s titles are integral to her art. If you take the time to go to her website, her Biography Section contains her full CV. Her solo and group show experience is impressive, as is her gallery representation. Behind her “Tongue in Cheek” biography and brutally honest artist statement, there is a serious and prolific artist whose work will delight your eyes and intellect. I was born into the Witness Protection Program so the details of my childhood have been kept from me for my own safety. I was released when it was discovered that I was never in any real danger at all. I was turned out into the street with a written apology, a pat on the head and a detailed invoice payable to the FBI for all that protection I never even needed. Talk about being behind before you even begin. Actually, I was recently paroled from a 15 year sentence in an office cube. It was a fortunate occurrence if you consider all the time I wasted wishing the window directly behind me could open. I grieved for about 5 seconds before going to my attic to find the paint brushes I remember being so fond of in college. They were a tad dusty and a little more than “slightly miffed” due to my neglect. It seems they forgave me after I introduced them to the shiny new tubes of paint I had purchased just for them. Now our days are spent in joyful anticipation of the challenges each new blank canvas presents. Except for the part about having a sketchy childhood, the first bit was a complete fabrication. Sorry, I couldn’t resist. I used to drink a bit. When I decided that I’d be better off if I put down the stemware, I needed something to fill a big empty space. I knew I liked art. I actually studied painting back in the 80’s. So armed with a 50% off coupon I hit the craft store. Like a bird I’m a sucker for shiny things and the silver Liquitex tubes called my name. At home with a few small canvas boards I began at the beginning. The memories I have left from childhood. Me sitting in the grass with a daisy, me sitting in the grass alone, me sitting in the grass while happy children played around me. It spiraled down from there. Turns out most of my childhood memories were pretty awful and I realized I was primed for exercising a few demons. My paintings are meant to be whimsical and kind of quirky despite the sometimes-desperate cry for help they really were. I needed to twist up my dark world into something colorful, comfortable and safe. Work I could laugh at and ultimately make peace with. My characters, the birds, cats, fish – whatever, are typically self-portraits or family members. They help tell the stories. I believe my style of painting stems from a wish for a bit of control over an out of control life. Layers of brush strokes build upon each other like mesmerizing little geometric color studies. I use a nearly dry brush technique in order to have the most control over the paint. You can often see the lines of the Sharpie marker used to draw out the canvas. A little bit is added – or left behind if I feel it enhances the work.